“They are the most repulsive tree in the vegetable kingdom,” wrote Captain John C. Fremont in 1844. 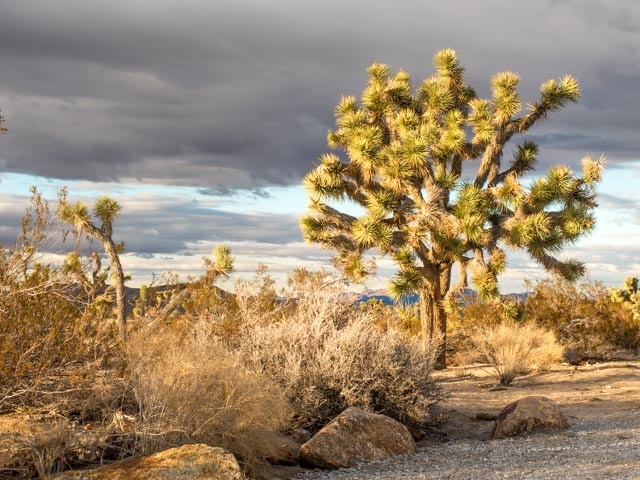 Known as the park’s namesake, the Joshua trees are a species of yucca growing only in the high desert, mainly the Mojave. 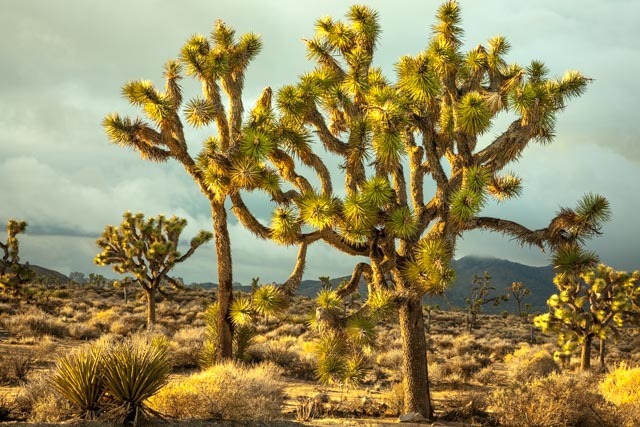 There are exceptions—it may be found growing in the Sonoran Desert next to the saguaros or mixed with pines in the San Bernardino Mountains. 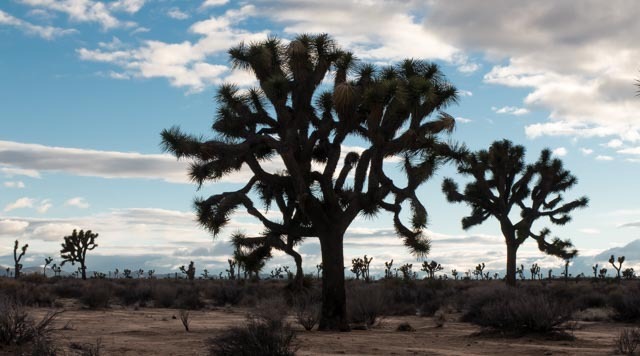 Repulsive or merely unique in its appearance, you can’t argue that Joshua trees are very distinctive. Many others might maintain that they make a very photogenic subject. After struggling through our first day under less than desirable conditions, Day 2 began more optimistically. We awoke to blustery skies in the morning. But wait! Did I catch a glimmer of blue skies too??? Fast-moving clouds were sweeping across a sky where cracks of blue were slicing through. Grab hats and heavy coats—the day was brisk (someone might say cold)—I had a destination already selected and it wasn’t too far away! 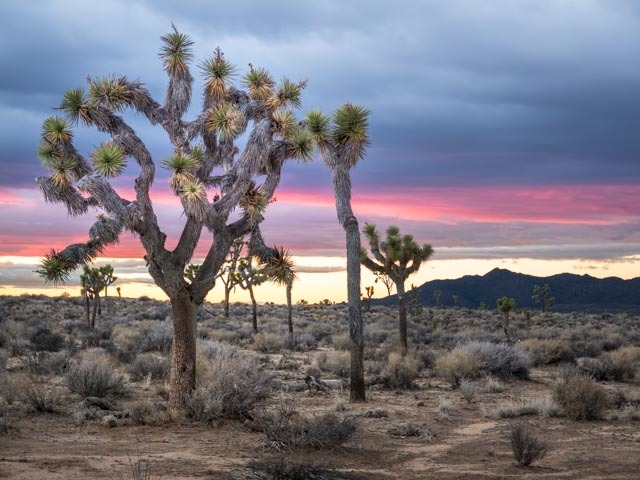 A lonely Joshua tree reflects the atmosphere of the morning. Arch Rock is another photographer’s destination, but it also holds opportunities for a fun exploration of rock formations as well. 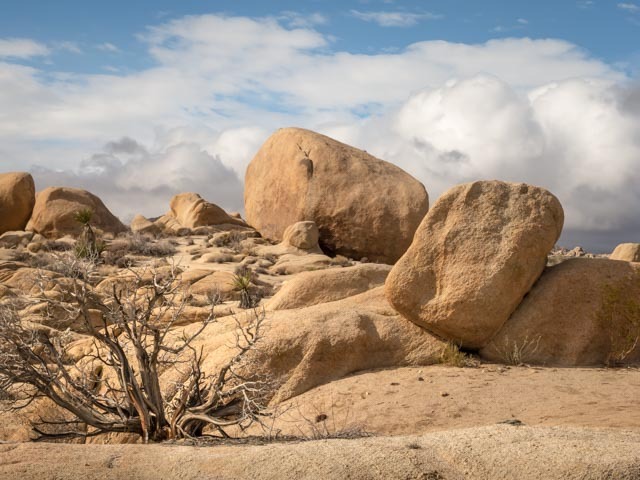 The trail could easily bring out the kid in you—it’s very tempting to climb over and around the huge rocks. A short trail, but most enticing. Exploring is the theme of this hike. 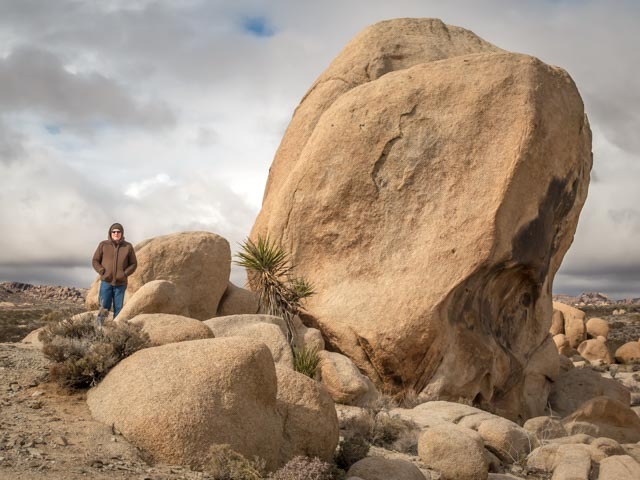 You’ll come across some fantastically-huge rocks. But the subject of this trail is the Arch Rock. To find its best “side” requires some off-trail maneuvering, but again that’s part of the fun. You’ll find the trailhead in the White Tank Campground near site 9. There’s some extra parking space further down the road, near site 15. 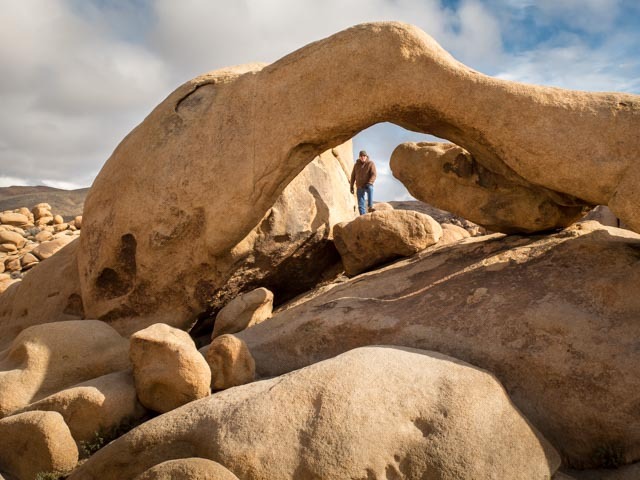 Arch Rock is one of the few aches in California deserts. Once walking on, you will undoubtedly discover other picturesque scenes. Slow down and look around—what this trail lacks in length or difficulty, it more than makes up for with scenic possibilities. 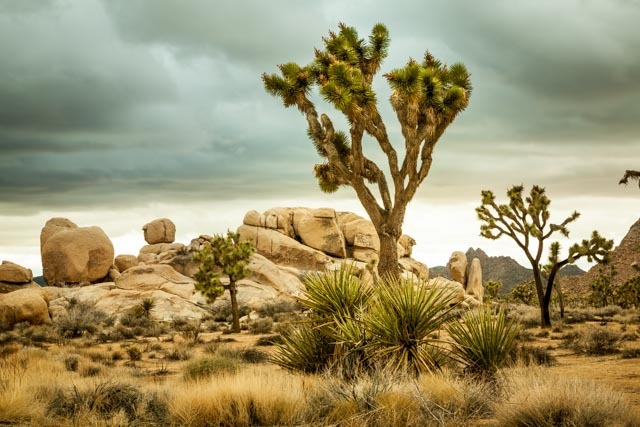 Like the saguaro cactus of the Sonoran Desert, Joshua trees are often featured prominently in desert landscape photography of the Mojave. 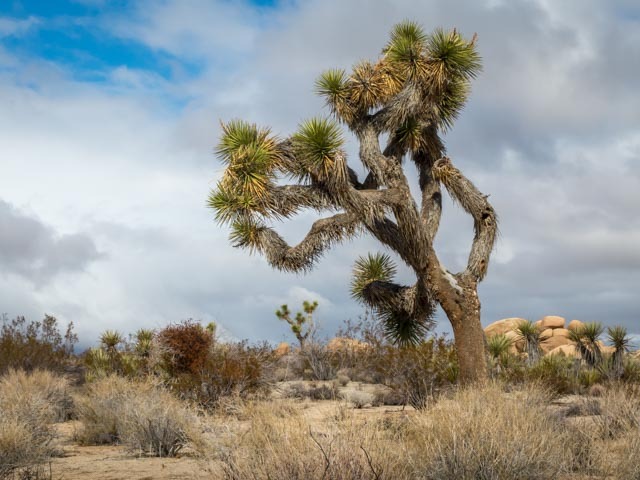 Out in the middle of Southern California, not far from Palm Springs, is one of the best places to find great numbers of mature yucca brevifolia, in Joshua Tree National Park. 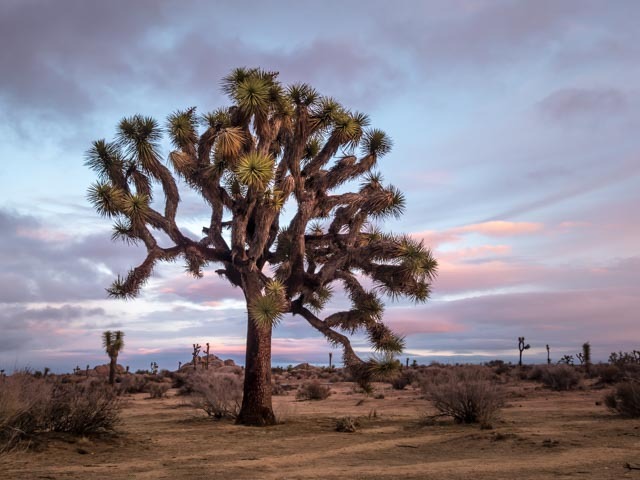 This strange-looking tree is not a tree at all but a giant member of the lily family, its branches covered with needle-sharp daggers. Native Indians appreciated its useful properties: tough leaves were worked into baskets and sandals, and flower buds and raw or roasted seeds made a healthy addition to their diet. 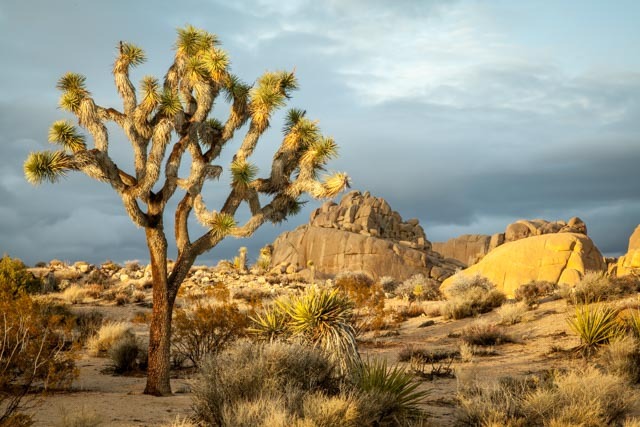 Mormon immigrants, upon seeing them, named the tree after the biblical figure, Joshua, seeing its limbs as outstretched in supplication, guiding the travelers westward. 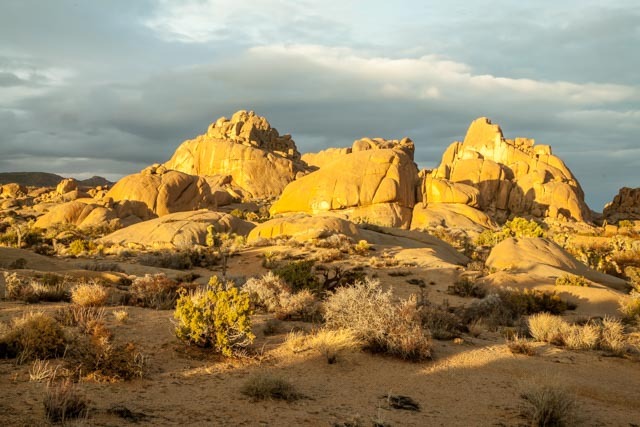 Concurrent with Mormon settlers, ranchers and miners arrived in this high desert with hopes of raising cattle and digging for gold. 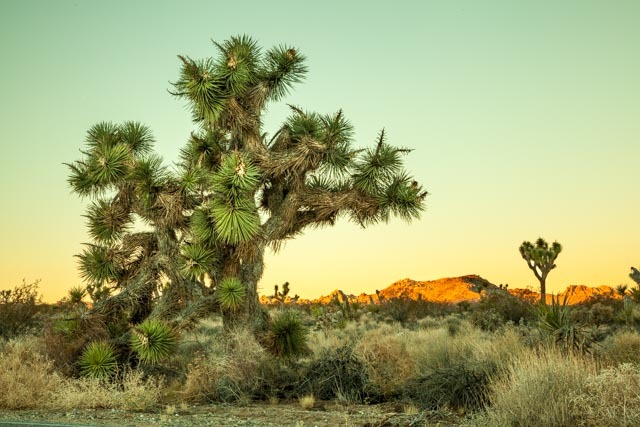 These homesteaders used the Joshua tree’s limbs and trunks for fencing and corrals. Miners found them a source of fuel for the steam engines used in processing ore. The promise of the morning didn’t hold for the day’s duration. Clouds rolled back in and once more the afternoon turned gray and lifeless. The light was flat and I was disheartened. In the late afternoon conditions began changing. Taking a leap of faith, I headed back to where the trees grew among the rocks. “Give me some light,” was my mantra as I drove. And for a brief moment in time, it happened. The golden light of late day struck, illuminating both rocks and trees. Now that is something I can work with! Even the rocks began to glow . . . it’s amazing what can happen in those rare moments of golden afternoon light! As sunset time approached, those same familiar clouds rolled back in, denying me an eventful shot. But I waited around and hoped for the best and finally was rewarded with a glint of some color. 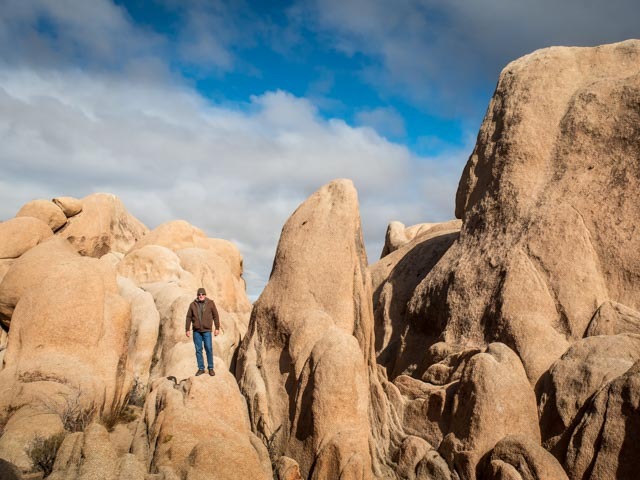 My last evening in the heart of Joshua Tree was not all in vain. I wasn’t giving up hope for my last morning either. Before dawn I was out once more, waiting with camera in hand. Yes! The day would be clear . . . these clouds were different . . . just enough to bring in some color. Joshua Tree might have made me wait, but in the end I saw this park in the best possible way. These trees, these rocks, all make for a wonderful experience (under a good situation). What looks on first glance as bare and starkly ugly, can be shown to have a certain unique grace. This park holds promise for those who cherish nature and are looking for some outdoor pleasure. I think Chris would agree (once he warmed up literally and figuratively) that this park was worth our time.
. . . moving on to other places. 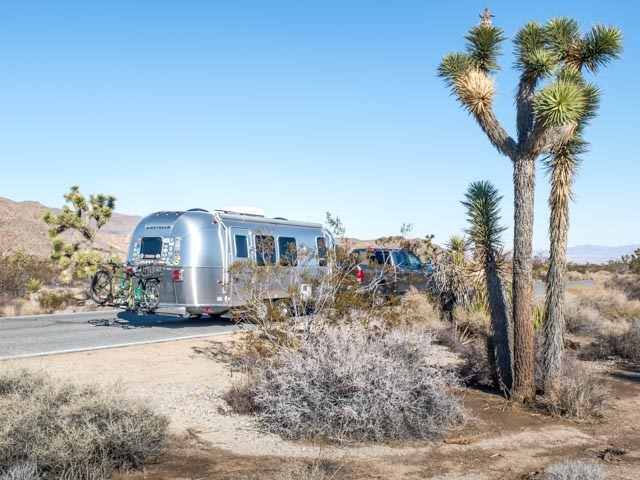 A 2016 Pendleton Airstream suits our lifestyle perfectly. It's a commemorative edition celebrating the 100th anniversary of our national parks. In our efforts to see as many of those parks as we can, the two of us are now spending several months each year on the road. We hope our posts and accompanying photos give a vivid description of where we travel, illustrating to our followers what's out there, just over the next horizon. 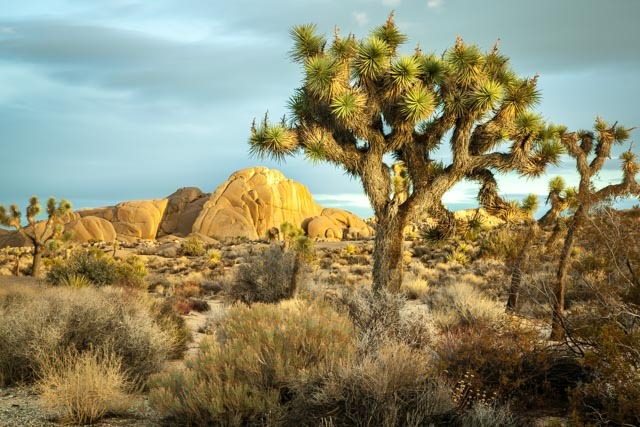 This entry was posted in California, Joshua Tree N.P.. Bookmark the permalink. WOW, as always. Wow. Beautifully, artistically, intelligently written, and incredibly well-taken photographs. I am lucky to get to read your blogs. If you, however, as this blog stated, thought it was cold, you forgot what cold was like. It is COLD here today. Wednesday, a couple of days from now, the low will be minus 1. Some places have been much worse, but I am feeling the worse cold of this winter this week. Happy trails, buckaroos. ‘Looking forward to all your messages. Hey, thanks for the nice words! It’s easy to write about these interesting places so different from the Hoosier landscape. And yes, I think we’ve lost our Midwest winter blood–when a mere damp 50 degrees feels cold to us!